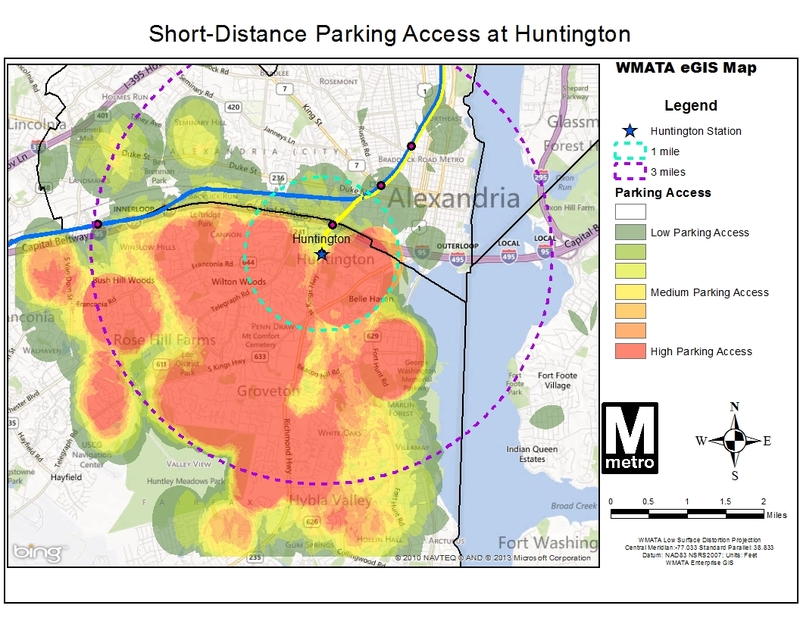 We continue to explore barriers to pedestrian and bicycle access to Metrorail stations with a look at Huntington station. Previous posts in this series explored Forest Glen and Southern Avenue stations. All stations profiled share similar characteristics in that they have a high percentage of short-distance (less than three miles) parking access, and low bicycle use. By looking at street layout, customer distribution and gathering your comments we are working to better understand barriers facing pedestrians and bicyclists and improve safety. 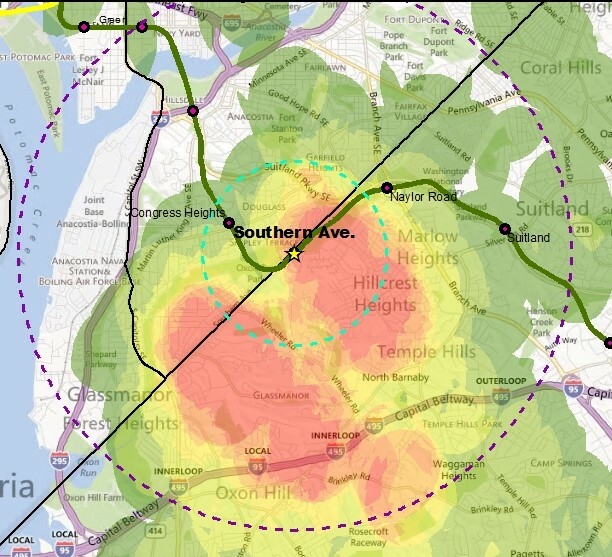 The map on the right (full version) shows auto access “hotspots” for Huntington station. Huntington is located in Alexandria Virginia less than a mile south of interstate 495, the Capital Beltway. The station serves as a park and ride option for commuters from south of the DC metropolitan area as it is the last station on the southern end of the Yellow Line and is easily accessible from the interstate. Still, roughly half of the 3,600 daily parking customers originate from the many residential areas within three miles of the station. Where Do Parking Customers Come From? One-third of Metro parking customers drive from less than three miles to their station. 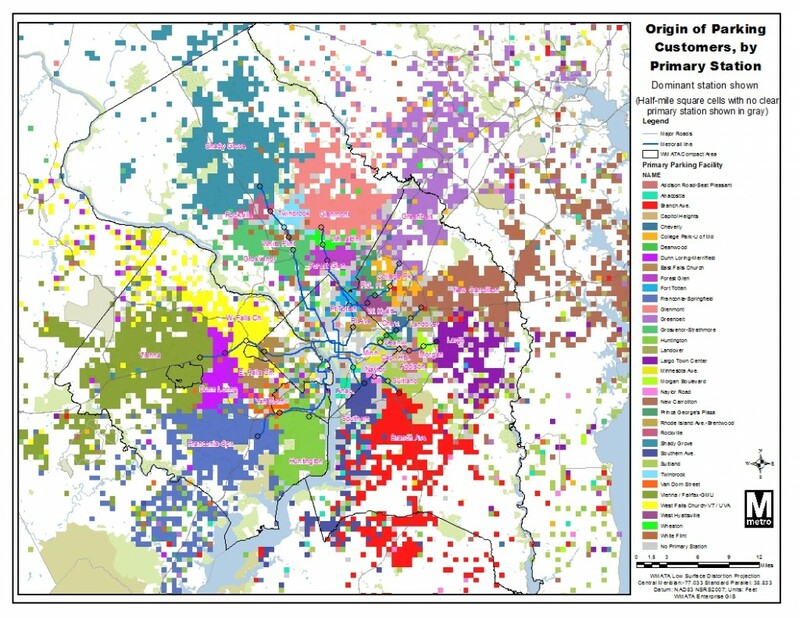 But Metro’s importance can also be seen far across the greater Washington region, in this new visualization of parking customer’s origins. 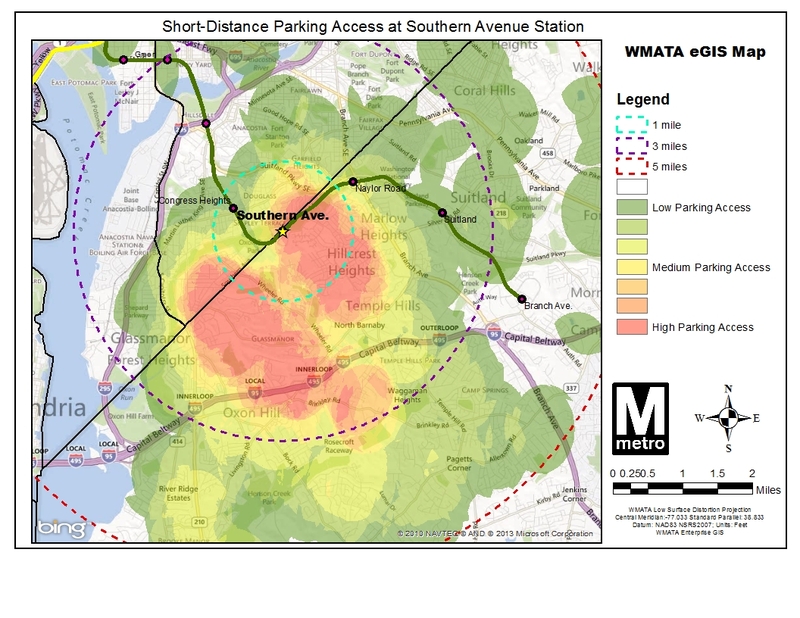 Most Metrorail parking facilities primarily serve the neighborhoods immediately surrounding the station: 64%55% of parking customers come from less than five miles away, and 47%35% come from less than three miles away. 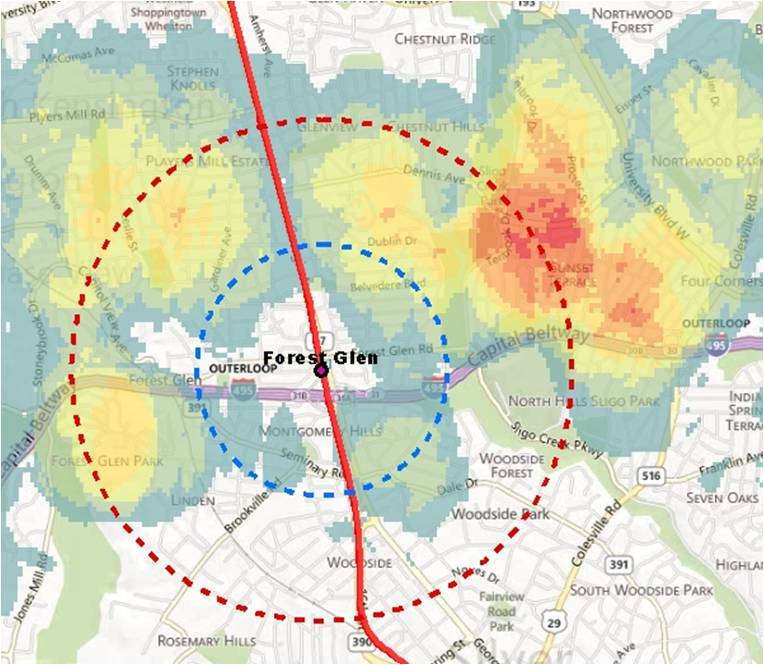 However, some riders come from much farther away, particularly to end-of-line stations near major highways, such as Greenbelt, New Carrollton, and Vienna. 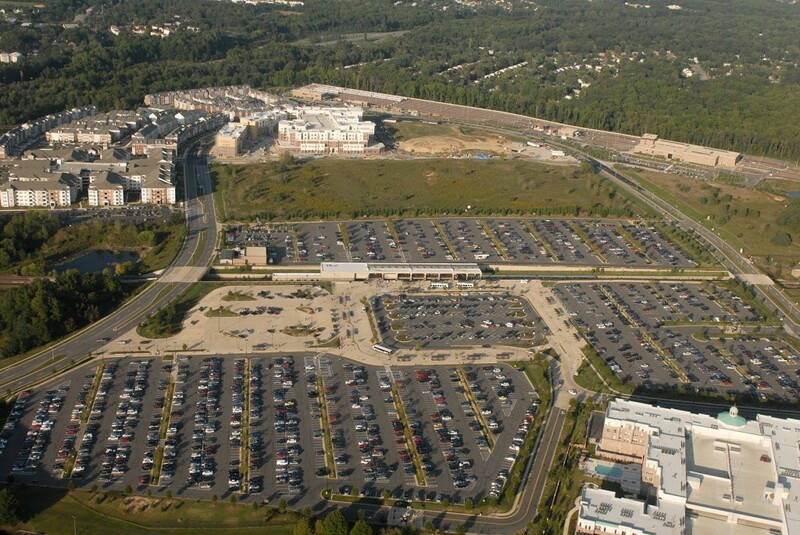 With approximately 60,000 parking spaces, Metro is one of the region’s largest parking operators. 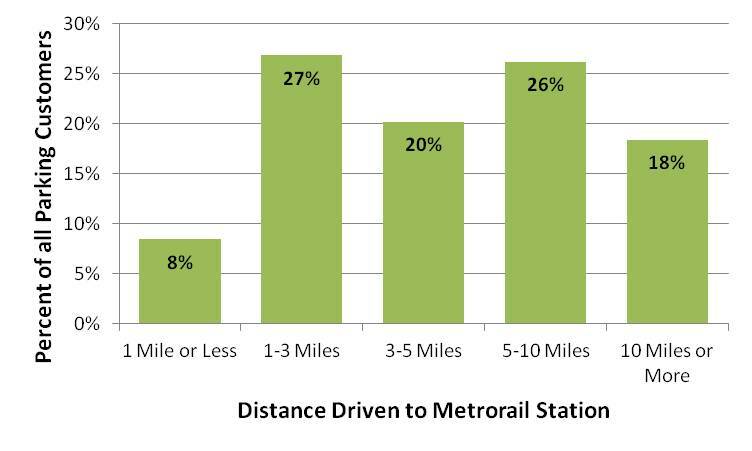 Our 2012 Metrorail Passenger Survey provides good insight into the travel patterns of rail customers, including those who drove and parked at any of Metro’s 35 stations offering daily parking. These parking customers represent around 15% of all rail trips on a typical weekday. A familiar sight at Metro’s metered lots is that of a customer searching for coins to feed the parking meter. Priced at $1/hour, that can add up to a lot of quarters or dollar coins. 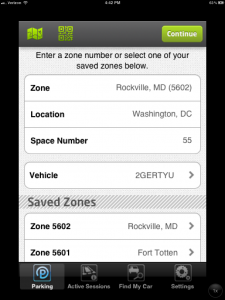 Starting Monday, July 30, 2012, at the Fort Totten and Rockville Metrorail stations, Metro is introducing a new parking meter technology from Parkmobile that will allow customers to pay for parking using a smartphone app or over the phone. 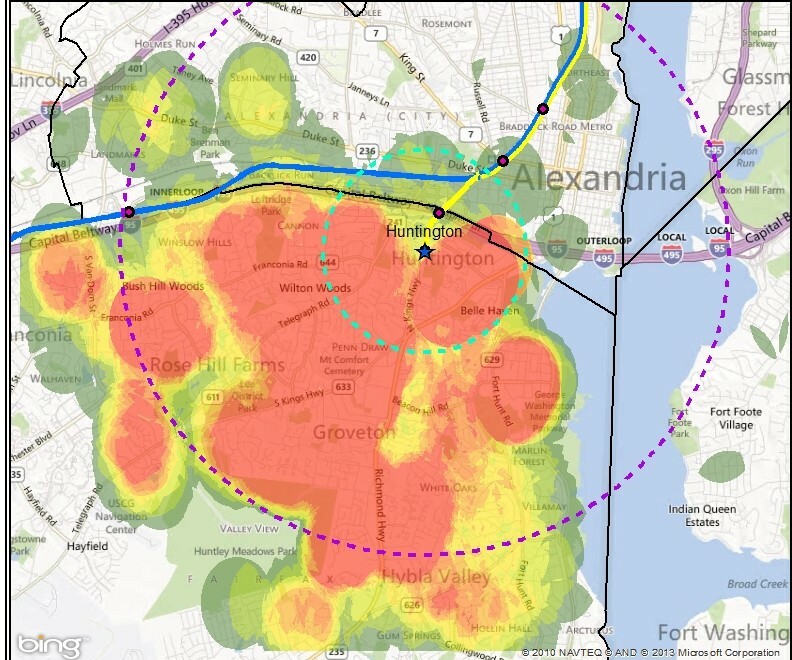 It’s the same payment system widely in use in the District of Columbia, but with an extra twist: within seconds, thanks to sensing technology from Streetline, the time you pay actually displays on the meter. You can find out about Parkmobile and download the app at http://parkmobile.com. This new Parkmobile payment technology is compatible with the “Parker” app by Streetline for iPhones and Android, which provides another option for cash-free payments while enabling many additional features. For example, you can find a parking spot in real time at the Fort Totten and Rockville metered lots, and the Vienna-Fairfax/GMU South daily surface parking lot. 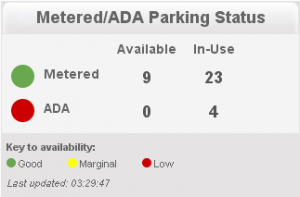 Additionally, Parker provides policy information for every single Metro parking lot and garage (even those without sensor information) — see http://www.streetline.com/find-parking/. What Does the State of the Commute Survey Tell Us? Last summer, the Metropolitan Washington Council of Governments (MWCOG) posted the results from the 2010 State of the Commute (SOC) Survey. Metro planners are reviewing the results now in support of our Regional Transit System Plan, which is looking to better connect areas of concentrated growth, such as the regional activity centers, and increase core capacity through 2040. The survey is conducted every three years to help MWCOG’s Transportation Planning Board better understand commuting trends and evaluate the effectiveness of its Commuter Connections program, which provides information about and benefits for commuting by transit and carpooling instead of single-occupancy vehicles (SOV). 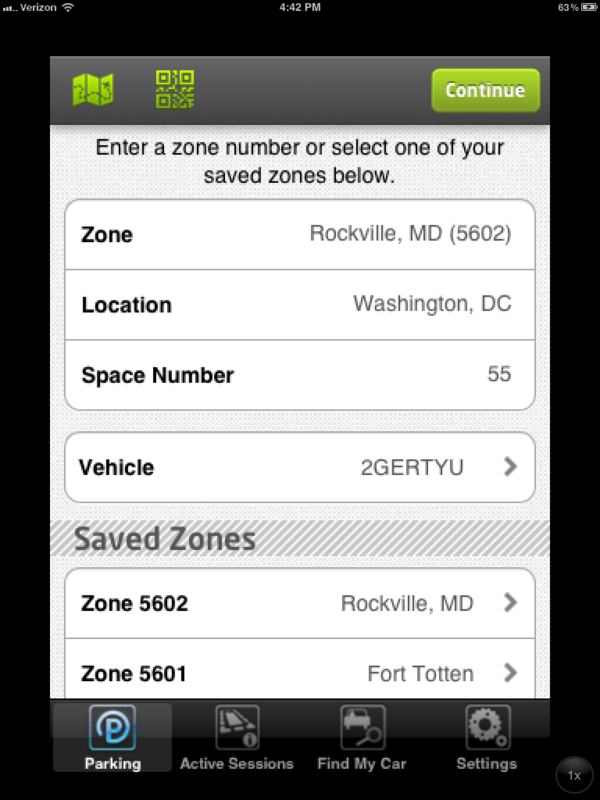 Screen capture of live parking information for Fort Totten. Click image for live site. As part of Metro’s ongoing effort to make parking more convenient for riders, a trial of real-time sensing has been underway at the Fort Totten Metro Kiss and Ride Lot for the past few months. This system uses sensors embedded in the pavement and in parking meters to let users know when spaces are available in the Kiss and Ride Lot, and when they should save time, energy and reduce their carbon footprint by driving to a different lot or using some other mode to access Metro. Eventually, we hope that a similar sensors and monitoring technology will be available at all Metro metered parking spaces as a customer service to riders and to improve transit access, information and use. Information on parking space availability reduces traffic cause by motorists search for parking and reduces pollution from vehicles being driven around in the search for parking. Metro’s early experience with promoting TOD took place at below-ground rail stations in established urban settings that did not require the provision of transit access facilities beyond connections from sidewalks to the stations below. 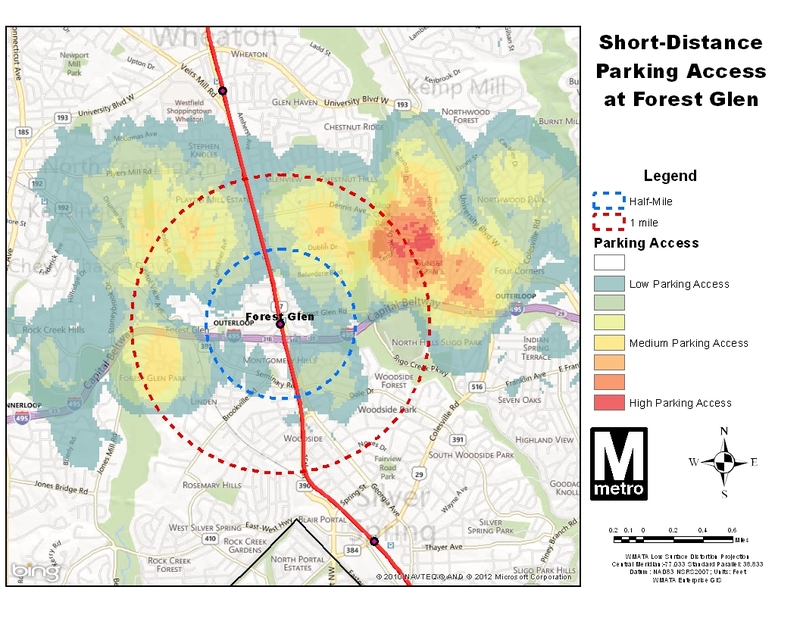 More recently, WMATA’s opportunities to develop its land to support TOD have been predominantly in suburban rail stations that include extensive parking lots, bus bays, and facilities for taxis, bicycles, customer pick-up and drop-off, and ADA patrons. The default agency policy in recent years has been to replace existing facilities with a like amount and kind of facilities on a reduced footprint, and to emphasize transit operational functionality over urban design issues. For example, this approach has tended to favor placing parking structures and bus bays adjacent to the station in lieu of pedestrian facilities, public spaces and mixed-use development. However, public feedback has prompted WMATA to reassess the appropriateness of this default approach, and there is a need for new thinking about how future patrons should arrive at suburban stations; how transit operations should function in TOD contexts; and how to better meet local development policy objectives. 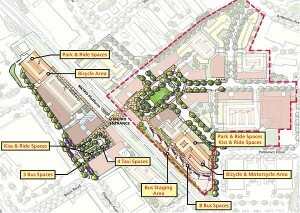 Development plan for Twinbrook Metrorail station. Click the image for more information. Over the past five years, WMATA has made a number of significant policy and program changes to recognize the changing development environment at suburban rail stations. For example, in 2008 WMATA adopted a new set of real estate development guidelines (1.91 MB PDF), and the first real estate projects implementing those guidelines were initiated in the summer and fall of 2010. While the evolution of WMATA’s planning and land development practice is underway, it is far from complete. WMATA’s most recently-launched TOD projects confront the agency with the immediate challenge of replacing first-generation, auto-oriented transit access facilities with a new generation of facilities that supports transit access, transit operations, and TOD.